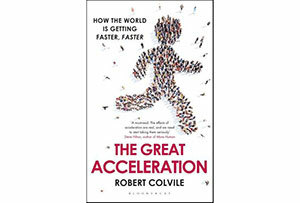 The Great Acceleration is a timely book on how the world is speeding up. But do the opportunities of running faster outweigh the downsides? Time is the currency of modern economic life. During the industrial revolution, minute hands were added to clocks. Cities woke to the sounds of bells calling people to the factories, work became calibrated by hours and shifts. Karl Marx considered long hours to be the way capitalists extracted surplus value from their workforce. During the 19th and 20th centuries, unions successfully fought to reduce the number of hours that employers could expect their workers to toil. Economic progress was supposed to free up time for workers. With greater productivity, more could be created more quickly, ushering in an Age of Leisure. Instead, life feels more breathless than ever. We are all expected to multitask. Information technology has torn the membrane between work and home. Traffic jams lead to road rage. The server goes down, and our collective blood pressure goes up. Robert Colvile makes a bold claim in the opening pages of The Great Acceleration: 'What single quality best defines how our society is changing?' he asks. 'Is it that life is becoming fairer, or more equal, or more prosperous? No ... it is that life is getting faster.' There are many symptoms of acceleration, and Colvile does a good job of describing them. He opens with Bob Levine, the world's expert on a topic that may appear innocuous: walking speeds. In the early 1990s, Levine and his collaborators timed how long it took pedestrians to cover the same distance - 60ft - in cities around the world. Levine found people in bigger, richer cities walk faster. In 2006, the experiment was repeated. On average, the time taken to cover the 60ft had dropped by 10%. Mostly this was because Asian cities - Singapore, Guangzhou - had accelerated. Their pedestrians had been Westernised. As they become more economically successful, societies do not rest on their laurels, as John Maynard Keynes predicted. Rather the opposite: we cram in as much consumption and information as humanly possible. The internet has added hugely to the acceleration. Speed is a religion in Silicon Valley. Colvile describes Google's 'Every Millisecond Counts' campaign, intended to shorten search times. Online retailers are obsessed with the time it takes to load or navigate a page. One-tenth of a second delay in loading Amazon's page means a 1% drop in sales. Software designers are constantly trying to find ways to help us get to our destination more quickly. And predictive software and autocomplete are part of the battle to move 'faster that the speed of type'. Consumers get more choice, more help, and quicker deliveries. But there are anti-competitive implications here too, Colvile argues. Getting faster very often means spending money - on servers, software, and so on. This means that the big beasts - Amazon, Google, Facebook - can stay one step ahead of rivals. Speed and intensity have become social as well as economic forces. Busy people are seen as superior to those who prefer to take a nap. As Elizabeth Kolbert writes in her New Yorker review of Brigid Schulte's book Overwhelmed: Work, Love, and Play When No One Has the Time, 'keeping up with the Joneses now means trying to out-schedule them'. Colvile writes in compelling fashion about the intersection of politics and the media - he is a former news director at BuzzFeed UK and comment editor at the Daily Telegraph. The only kind of rebuttal that counts is of the instant variety. Politicians seek not just to win the news cycle, but each minute of each day, through multiple channels. Colvile's book went to press before Donald Trump shocked the political establishment - but he perfectly illustrates the case. Trump has admitted to tweeting his thoughts as he lies in bed watching the TV, and then watching as his tweet is reported on the TV he is watching.